If you haven’t had a chance yet to sew that Gallery Tunic or Dress that you’ve wanted to, here is your motivation to get one done! 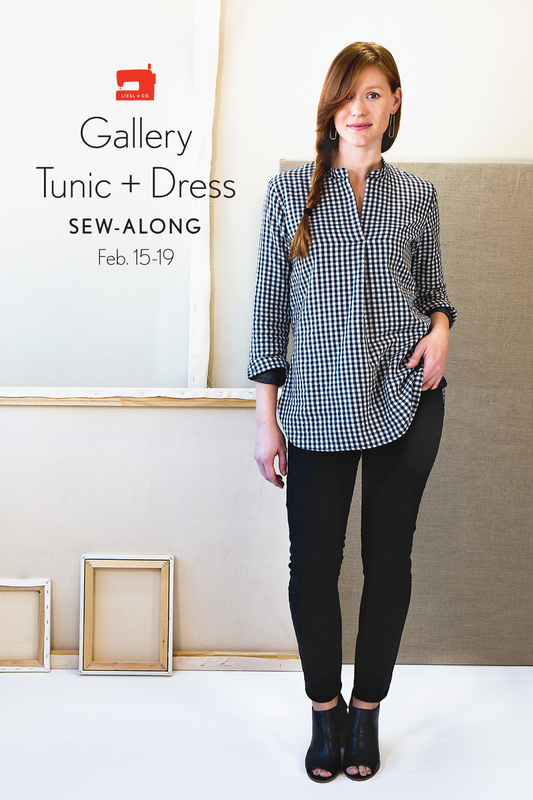 We are happy to announce that we will be hosting a Gallery Tunic + Dress sew-along next month from February 15 to February 19. And we hope you will join us! This pattern was very well received when it was released last May. At that time Liesl also offered some great styling inspiration so be sure to check that out. Liesl will be back here next week with some fabric suggestions. Relaxed-fit pull-on tunic or dress. The tunic features cuffed three-quarter-length sleeves and a one-piece collar. The dress includes in-seam pockets, button-cuff, full-length sleeves, and a band collar. Both versions include an inset front placket with a fun pleated detail, an inverted box pleat at back, and a curved shirttail hem that’s slightly longer in back. Effortless and feminine, this flattering classic-but-contemporary piece can take on many different looks depending on how you style it. Five talented ladies have been gathered to form a panel. Are you ready to be amazed? Here they are! To kick off the sew-along, the second week of February we’ll feature each panelist on the blog. Each panelist will talk about their design decisions and fabric choices. Be sure to get your pattern if you haven’t already. It is available in both paper and digital format. Also gather your fabric and supplies, and we will see you in the Discussion Forums Sew Alongs group on Monday February 15th! 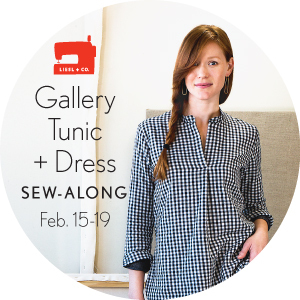 The sew-along will be hosted by our good friend Brittney from Sewing for Four (Plus One!). Tag your in process photos of your Gallery garments with #lieslandco on Instagram so we can all see. Enter to win a $50 gift certificate to the Oliver + S website! When you have completed your Gallery Tunic or Dress, post it somewhere and then add a link to it using the button below. Any Gallery Tunics or Dresses made since January 1st, 2016 can be entered. If you sew more than one, enter each one separately. All entries must be submitted by Friday February 26th 11:59 PM ET. The five panelists will vote for their favorite, and the winner will be announced on Monday February 29th. Hmmm. I have made 4 already, but I wouldn’t mind making another! Wow, Emma, we should have a separate prize for you for making so many! Lynda, our measurement chart is the same for both patterns, but I never recommend assuming you’re one size for any pattern range. You’ll have your own fit preferences, and every pattern will fit each differently due to style ease. So the short answer is yes: the sizing is the same. But the long answer is never assume just because one pattern fits you in one size another pattern will fit you the same way. Does that make sense? I think you should be safe since they are both a pull-on style. I made the same size in each. I found the Late lunch tunic to be a TAD roomier but only a little bit. I only mention that because if your late lunch tunic is at all snug, you might want to size up. Maybe a wearable muslin would be a good idea if you want to be safe. When I want to make one I look for a Joann’s coupon and get a woven cotton for 50% off or so and make a test version out of that. If I like it, I end up with an extra garment and if I don’t, I haven’t wasted much money. This is perfect! I have been itching to make mine, gotta get it printed! I haven’t been able to get the Sew-Along badge to work on my blog. Anybody else having trouble? It may just be my (lack of?) skills…. Cate, I’m going to guess that when you copy-paste the code for the badge, you computer or your blog software is changing the quotation marks from straight quotes to “leaning” quotes. (I just saw this happen on my machine when I was testing this out for you.) When this happens, the code gets messed up. Once you paste in the code for the badge, save it, and then view what you have in text view. If you see code that, in place of just a plain quotation mark, has a quotation mark and then an %3F (or some other strange quote of symbols) you’ll know this happened. Delete everything but the quotation mark wherever it appears in the pasted code, and the badge will work fine.